Celebrating Easter is a tradition in many parts of the world and usually involves a short holiday, allowing people to make time to get together with family and friends. Sharing the celebration of Easter also means sharing food so it's not surprising that there are also traditional foods for eating at this special time of year. These include hot cross buns, simnel cake and, of course, easter eggs. Why then are certain foods associated with Easter? It's a good question and one which many of us overlook, simply taking forgranted that we may be given some simnel cake or a hot cross bun when out visiting over Easter. To answer this and other questions about Easter I decided to read more and I found 2 great websites which I'd like to share with you - for no reason other than they are really good, interesting resources of information. The first is called Kaboose which is a well established site all about family, food, home and crafts. This page is worth visiting - ideas for Easter recipes (including an Easter Basket Cake). 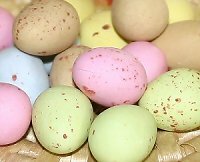 The second is a page on the BBC website about Easter traditions which covers why certain foods have a connection with Easter - eg. simnel cake and hot cross buns. It also goes into the tradition of Easter eggs and why they are still so popular today. If you are cooking a special Easter dinner this weekend, there's certainly no shortage of ideas for good recipes to try and, not wanting to miss out on such an opportunity, I'm going to add my 'three peneth' (great, old Yorkshire saying!) by suggesting one of my own recipes - rich white chocolate ice cream. I made some recently and even went so far as to add a little mashed banana as an experiment. The end result was delicious though a single scoop was more than enough for me as it was very rich! Whatever you're doing over Easter - have a happy one!